On Del Blotto: As people sometimes hit up to three wineries before their appointment at Del Dotto, we added food to the experience (salami, cheese, pizza, etc. ), to keep people from getting blotto. The New Facility: Ca’Nani means House of Dwarves, aka a Venetian fairy tale, aka Snow White. Now we’re going from Vegas to Disneyland, our newest location will be across the street from Mustards in Oakville, and it’s set to debut in August 2015. Wineries just might want to expand on the trends. As all three million visitors want to be entertained. One tasting room is successful, then I opened the second, and each has its own story behind it. This will be a new chapter in the book of wine. For the trends, like wine and food pairings, our new place will be like going to a beautiful gourmet Italian garden. I want to build something that I myself would want to go to. And that means showing the beauty of Napa – so going outdoors will be the next step; I see gardens and mountains in the view, while sitting under an ancient fig tree and eating a two-day stew of wild boar, or a slice of pizza piping hot from an outdoor pizza oven; and all over great wine. Take the wine into the garden to eat. Then visualize more: an ancient Italian garden, people shaded by olive trees while watching food cooking before you. Membership: (I had to ask again about their wine club) VIP club, $2,000 is first level and $5,000 is second level. Come taste with them and choose your wine a year in advance. Big difference is that the member selects the wine instead of the winery. It’s like getting fitted for an Italian suit. New members may be skeptical of the process until one year later and they get their tissue wrapped wines, then they remember the tasting a year ago, and they get it – that it really works and it really happened. On Winemaking: Gerard is the master, Del Dotto just loves interacting and seeing how it all works out. 1000 hummingbirds getting the best flowers and the best nectars for their wines, that’s Del Dotto. Zanzonico picks the grapes when the birds, not just the scout, come out of the tress to eat his fruit. We are teaching the public about barrels and aging their wines. Zanzonico has been making wines here since 2006 and people can tell. 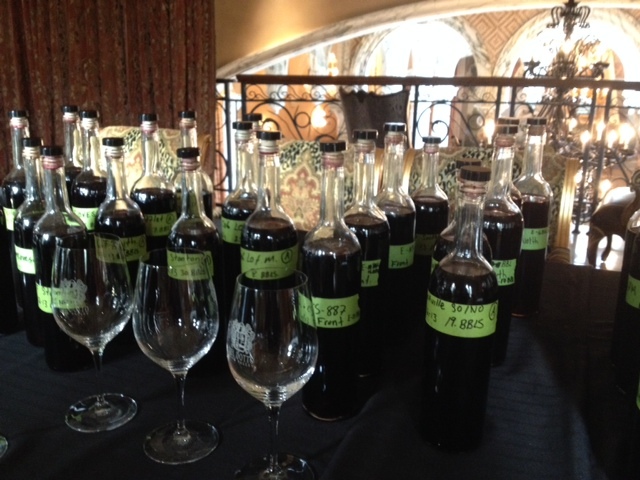 There are no library wines at Del Dotto and they can’t sell to restaurants either as there isn’t enough. Do I blend early or late? I believe you can sometimes ferment different varietals together – if they ripen at the same rate – so that they meld/marry. Giovanni 2013 was the first time they blended the two different grapes together. Like a good baseball team working together. All mountain wines, like our Howell Mountain Cabernet Sauvignon, take a year longer than the valley floor. Theses wines are the “closer” or “hand of God” wines to drink at the end of the night. The Beast, a blend of all vineyards, is a Parker favorite, though he didn’t know what was in it. 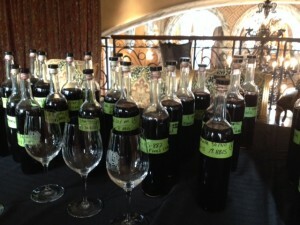 All of the 2011 vintages sold out, people are buying futures. If you want to make high-end wine you have to spend time with the grapes. As a winemaker you must pull out different notes from the vineyard. Vines are all over 20 years old. Sangiovese, planted 1990 in Rutherford, ages beautifully per Del Dotto. These, made on the valley floor, show beautiful balance. Will make their Giovanni Tuscan Reserve blend with this Cab. Merlot, Sugarloaf Vineyard in Napa, firm, balanced, moving on schedule. Merlot, Rutherford, Estate, Seven Rows, soft and rich per Del Dotto, different fruit profile. Cabernet Franc, Sugarloaf Vineyard, bright fruit. Cabernet Franc, Rutherford, Seven Rows, very well done for being so young. 887 Cabernet, south and front, nose is good to go, taste is fruity. Zanzonico blended these two together, Del Dotto joyously smacked his lips together while tasting, saying that he liked the fruit and earth components. Oakville vineyard, north and south, blackberry juice, jammy. St. Helena Mountain vineyard, block one, purple-black color, firm tannins. St. Helena Mountain vineyard, block two, highly rated, green and dark fruit. Rutherford Vineyard, north, clone seven, Margaux clones. Rutherford Vineyard, south, clone seven, Margaux clones, ready to drink now. Giovanni, 887 Cab and estate Sangio, 50% of each. Villa de Lago, Pritchard Hill, 100% Cabernet Sauvignon, cult wine, Del Dotto said sweet berry fruit. Zanzonico’s favorite. 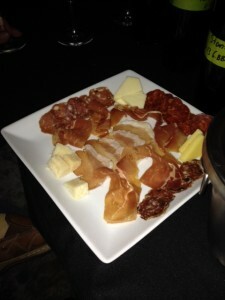 About halfway through our tasting Del Dotto suggested we have some of their home-cured salumi and prosciutto, we declined as we were headed out to dinner after the tasting. 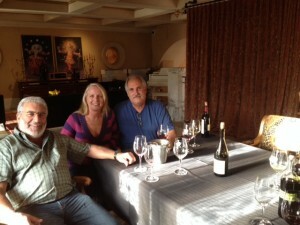 A few minutes later their Salumist, Tony Incontro, walked by and Del Dotto suggested he join us in the tasting. Within minutes Incontro was regaling us in stories about his work, the pigs he had selected and the flavors of the famous Prosciutto di Parma he hoped to capture. We gave in. All excellent, I wish I had taken notes just on each. Tony is the Salumist and Sous Chef at Del Dotto Winery, a family-owned winery which focuses on small production, premium wines. He has worked in many other indisputably fine establishments, including Perbacco & Barbacco, Martini House and Omaha Country Club. Tony’s love affair with salumi started at age 8 when he would help his nonno from Calabria break pork and make salame in the garage during the winter. He is a “chef gone curer/salumist.” Primarily using Mangalitsa hogs and helping to preserve and promote this noble breed has become a vital “ingredient” in his work. 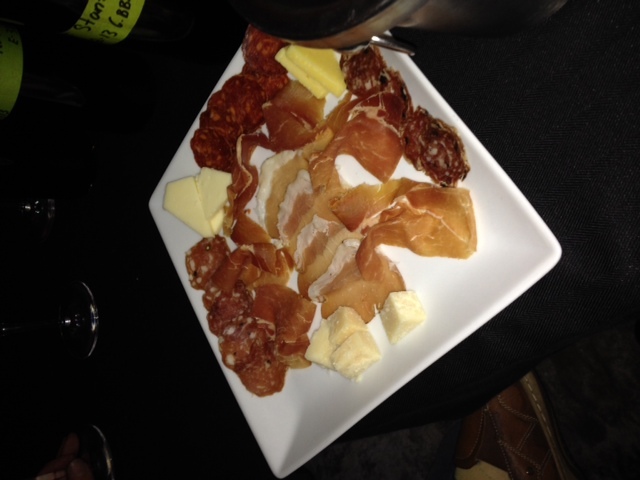 Keep an eye out for Incontro Salumi in the bay area! I remember you from that day! I never saw the article you wrote up, until today. Thank you for including me in it! That was very nice and generous of you!